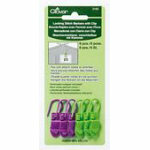 Locking Stitch Markers with Clip. You can attach notes to stitches, perforated notepad included! Package contains 6 markers in 2 colors.